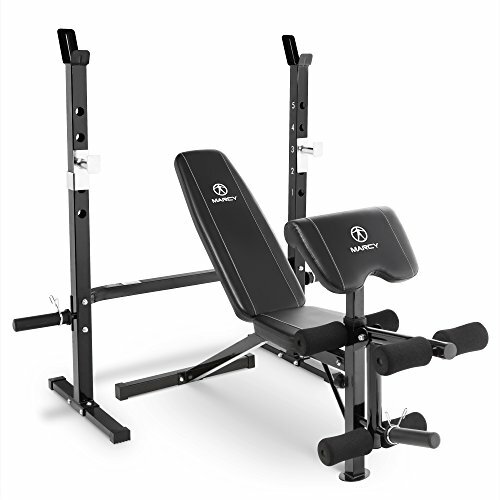 The Marcy 2-pc Olympic Bench MWB-60205 brings the functionality of a gym to your home in the compressed form of a weight bench. The full-body workouts that can be done on this bench will hit every muscle in your body - biceps, quads, triceps, pecs, abs, hamstrings, and more! This bench is a great addition to your home gym. It will give you access to working out every muscle by including a preacher curl pad, dual-function leg developer, and two-piece bench (making squats easily accessible!) The variety is also brought on by the adjustability of this bench; easily adjust the bar catches to what is most comfortable for you. In addition, the bench is adjustable to six different positions ranging from: flat, incline, and decline. You will not regret bringing this bench home because it will last you years! The robust steel tube frame can endure heavy duty use while the powder coated finish will safeguard the bench's longevity. The maximum weight capacity of the bench, including the user’s weight, is 600-lb. The bar catch has a maximum capacity of 300-lb. The maximum capacity on the leg developer is 100-lb., while the weight storage post’s total capacity is 150-lb. The assembled dimension is 73 x 61 x 58 inches in length, width, and height respectively. Shipping Box Dimension is 62.5L x 17.5W x 10.5H inches. 2-year limited manufacturer's warranty included. Maximum Functionality - The standard use of an adjustable bench (Incline, Decline and Bench Press) is combined with a preacher curl pad to give you a well-rounded upper body workout. The leg developer allows you to do Leg Extensions and Leg Curls. Adjustability - Slide the bench away from the rack to create a squat rack, adjust the bar catches to your comfort for each exercise, and adjust the bench as needed for each exercise. Dynamic Bench - Pairing it with optional dumbbells and/or an Olympic weight set, this exercise equipment will help you achieve all your fitness goals - body toning, muscle building, strengthening and much more! Durability - This workout bench is built to last with a 14-ga steel tube frame. Precision welding and strengthened hardware keeps it all together securely. It is topped off with a powder coated finish to ensure the longevity of your home bench. Comfort - MWB-60205 is versatile, adaptable, comfortable and durable. The bench has boxed upholstery with high-density foam to provide a supple yet supportive surface to make your workouts pleasant. Convenience - With the intention of being the best home weight bench, the rack of this equipment includes Olympic weight plate storage posts, which avoids the stress of having to find somewhere to store your workout weights.